In this 2-part training offered in the fall and spring, you will learn how to organize, plan, manage, and sustain a garden. This fall’s training is on 9/18 & 9/19, 6-8pm is open for registration ($30); teachers may attend for free by contacting bianca@sustainablefoodcenter.org to sign up. In this 2-part training offered in the fall, you will learn TEKS-aligned lessons and activities to use in the garden, as well as classroom management best practices. This fall’s training on 10/23 & 10/24, 6-8pm (free) and is open for registration. 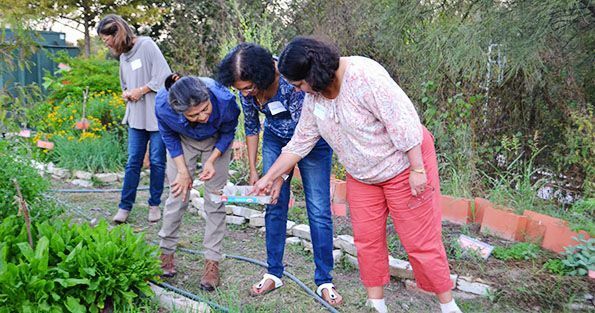 Free classes: Held at partner host sites throughout the Austin area in the fall and spring, these 3-part class series provide a hands-on, in-depth food gardening educational experience. Registration is primarily limited to the host site’s clients and therefore not published on SFC’s Classes page, but spots are available for teachers. Contact mia@sustainablefoodcenter.org for a list of upcoming free Intro to Food Gardening Classes this fall and to register. For-fee class: Offered in the fall and spring at SFC’s Teaching Garden, this in-depth food gardening class is a 2-part series ($60). This fall’s class will be held on 2 Saturdays, 9/22 and 9/29, 9am-12pm and is open for registration. All proceeds from for-fee classes go back to supporting our free programming. We look forward to supporting teachers in their school efforts!